Now, CES isn't quite the on-the-ground reporting slog it once was for Android Police. The number of smartphones announced at the show is tiny, and much of our work stems from various briefings and meetings rather than rubbing shoulders with attendees on the show floor. But my laptop still gets its fair share of use, from coordinating with the team in Slack to writing up news posts and notes during briefings, it does have to work as a "real" computer. The benefit to working for Android Police is that basically all of my work can be accomplished in a browser. Slack, our project manager (Basecamp), and WordPress (for publishing) all work perfectly well in Chrome. 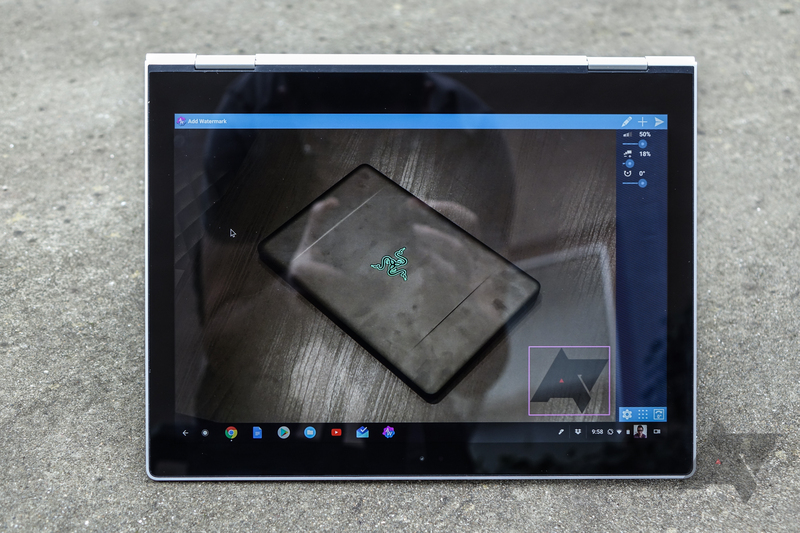 The big hurdle for me has always been image processing, and with the Pixelbook I finally think I'm ready to say Chrome OS can handle it, at least once you get a workflow figured out. It did take some trial and error, but once I got into a groove, the Pixelbook proved itself a truly excellent mobile platform for my job. 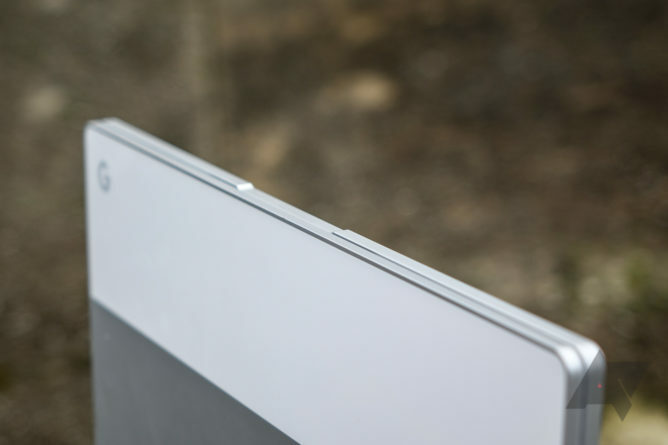 CES is a fairly gear-heavy show, which makes the Pixelbook nice - it's extremely thin and light, and the battery lasts a long time. I stuffed it in my Timbuk2 messenger along with my camera. I didn't even bring the charging brick with me when we'd leave our Airbnb because I find I can get well over seven hours of fairly intensive use from the Pixelbook, and probably can eke out nine or ten if I really need to. I never did throughout the show, and once I uninstalled a bunch of old Chrome extensions and Android apps I didn't use (something was causing the CPU to spin up unpredictably), I never really paid much attention to the Pixelbook's charge level. The only accessory I really needed was a USB-C SD card reader. The Pixelbook doesn't have a memory card slot, and my traditional USB-A card reader wasn't an option, as the Pixelbook only has Type C ports. This $12 investment was something I was willing to put up with, though obviously any dongle isn't an ideal dongle - I'd prefer not to have to deal with this stuff at all. Theoretically, a USB-C to MicroUSB cable would have done the job if I directly connected my camera, but I prefer the ergonomics of popping in a memory card when I'm sitting with my laptop in my lap as opposed to having to plug into my hefty RX10. 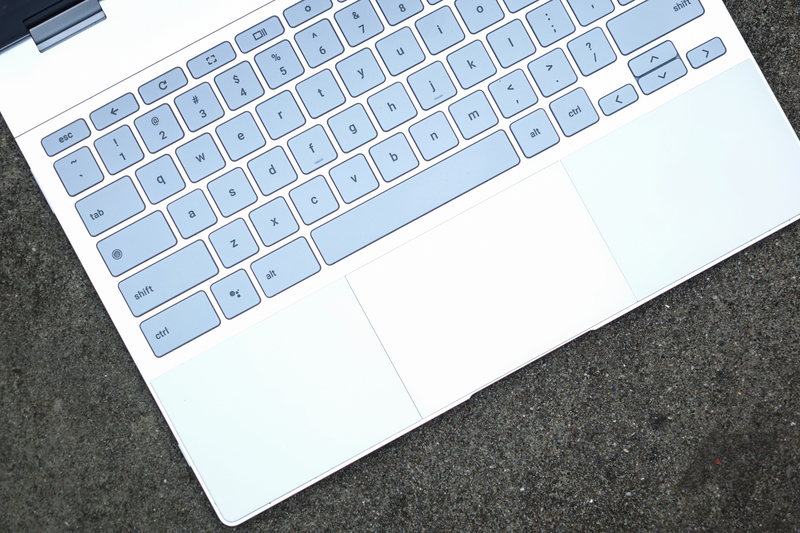 The Pixelbook's keyboard is a dream to type on - and that's a big part of what makes it a great mobile productivity device. Aside from that, my Pixel 2 XL provided hotspot connectivity (and the Pixelbook can charge it fairly quickly if need be), and I had my Bose QC35 II on hand if I needed headphones for any reason. The Pixelbook does have a headphone jack, but I find Bluetooth headphones work pretty well with it, and it's a lot easier to work with a laptop that doesn't have a cable sticking out the side of it. As I said, most of my work was easily done through the browser, as most of Android Police's core tools work in a browser. Slack, Basecamp, WordPress, and Gmail are my always-opens, and they're all perfectly fine on the web. It's no different than being on my Windows laptop in that sense. I don't have a lot to say about any of these things, because they just work as I'd expect, and it's in those tools where the vast majority of what I'm doing day to day here at Android Police gets done. The pain point for me has generally revolved around the issue of processing images for use in posts. That is, getting an image off my Sony camera, onto the laptop, and then watermarked and resized for use on Android Police. Adobe's Lightroom software on Windows makes this extremely easy and efficient. Things on Chrome OS just aren't as simple, unfortunately, but my workaround eventually became pretty quick for me. First, you have to remember that Chrome OS doesn't utilize a traditional file system. In fact, almost all folders and libraries on Chrome OS are read-only from the file manager, meaning you can't just drag images from your camera into the "images" library or a folder in it. This makes no sense on a practical level (I am sure it works this way for a reason), but working around it isn't terrible. The one easily-accessible folder with write privileges is Downloads, and you can just create subfolders in the Downloads folder to keep your stuff organized. Before you rush to comment: importing my photos for upload to Google Photos using the tool in Chrome OS isn't an option. I need to watermark and resize these images in batches, and the app I'm using (the only one I've found that does anything like this) needs the files to be local if you're going to process them in a batch job. So, my workflow was as follows. The workflow on Lightroom is actually kind of similar, but Lightroom has substantial benefits. For one, Lightroom is an extremely powerful image editor, but it's also exceptionally good at keeping you organized - it keeps things sorted by dated folders, you can flag images to create a quick favorites selection, and the import tool automatically detects and won't bring in duplicate images. The tool I used (shown below) is comparably very simple, though it has a reasonably strong watermarking feature set and a few other tweaks that make it handy for general image processing (like batch resizing). When all was said and done, my images were downsized for quicker upload and watermarked in probably twice the time it would take me to do the same thing in Lightroom, but that's not really all that long - maybe three to four minutes with this tool versus one to two using the Adobe software. It's hardly a big sacrifice, and my only real gripe is that this Android app is far more optimized for touch than a mouse pointer, so I ended up using the Pixelbook in tablet mode oftentimes when I'd be doing this. Once the images were processed, I'd upload them to WordPress just as I would from any other computer. There was no difference. This is the part where you expect the big "It was great, BUT!" moment. Here's the thing: there was no "but." The Pixelbook is a great laptop from a hardware perspective. The keyboard is an absolute dream to type on compared to my XPS 13 that cost nearly twice as much, the battery life is excellent, the large trackpad is very good, it's extremely stable, and it's the perfect size for travel. The Pixelbook is basically my dream portable work machine. 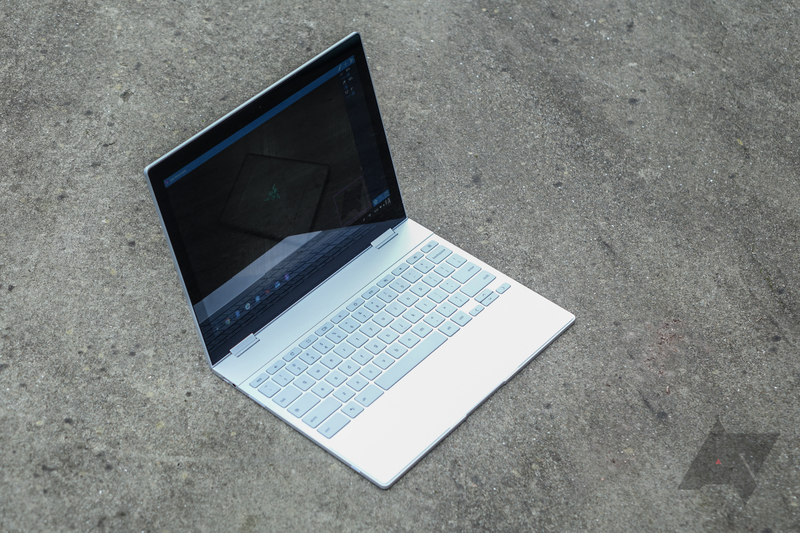 And it works great as a personal laptop, too - I use the Pixelbook at home all the time. 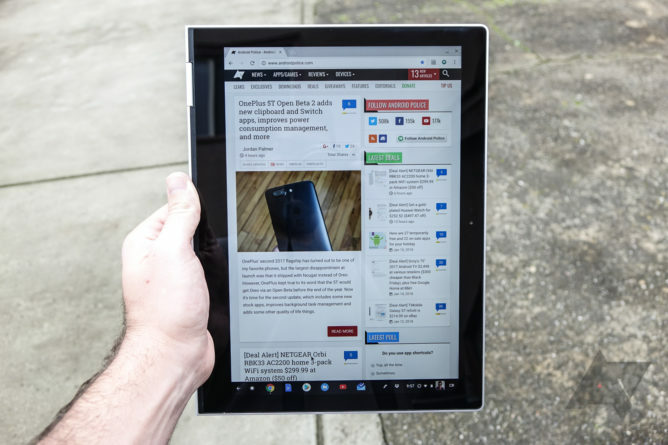 Android apps, it turns out, really were the missing piece of the puzzle for Chrome OS. And as Chromebooks only become more popular, more attention will be paid by Android developers to the platform. Maybe even Adobe will eventually get batch watermarking and resizing integrated into the Android version of Lightroom (which is already UI-optimized for Chrome OS) this year. But it's the fact that the Pixelbook delivers a tier-one laptop experience in addition to Chrome OS itself that really sold me here. 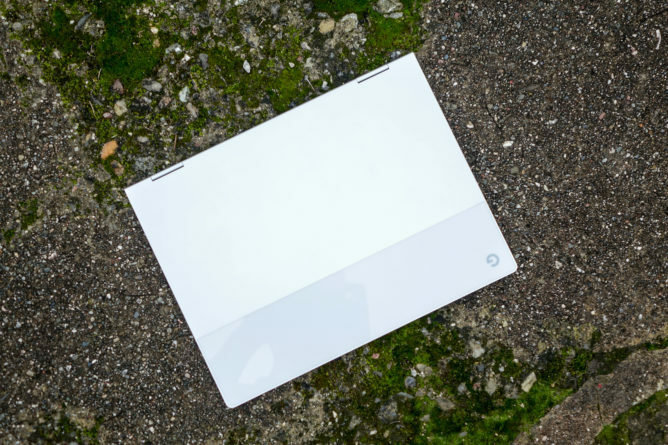 The Pixelbook is just a wonderful laptop to use, and come the end of February, it's the only one I'll be putting in my bag on the way to Barcelona for MWC and the launch of the Galaxy S9. Doing "work" in Chrome OS still inevitably comes down to your ability to adapt to a browser-first, apps-second operating system. And if Chrome and the Play Store can't get you the software you need, you still may find the platform a dead end. I'm not saying Chrome OS is going to be amazing for everyone - I'm saying that as someone who previously scoffed at the idea of using only a Chromebook for trade show coverage, I'm now a convert. Chrome OS has reached a point of maturity for me that has rendered my Windows laptop largely obsolete. That's not something I thought I'd come away from this experiment so certain of. Google's big bet on the web as a "do everything" platform finally appears to be paying dividends. And the Pixelbook is the perfect canvas for that vision.